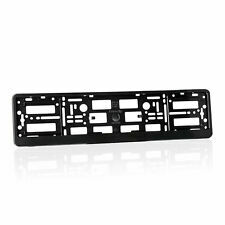 Size of holder fit all standard number plates, which have maximal Fits UK standard plates (pressed number plates). Universal for any Car. 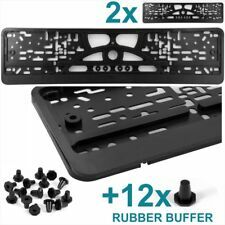 License plate holder SIMPLE-FIX The universal fixing set Simple-Fix offers the optimal possibility, without annoying puncturing, yet simple and frameless the plates on front & amp; Very easy to attach the rear. Thus, UTSCH has revolutionized the license plate attachment! Complete attachment set for two license plates. -Super strong adhesive KLETTOX holds in any weather, speed even wash! -Suitable for all EU flag with the dimensions of 360-520mm x 110 / 120 quick and easy installation without spec. Tool - Super optics frameless - the principle: per plate 1 x hook and 1 x Velcro adhesive without tool or screw - heat - and cold-resistant from - 30 ° c up to 100 ° c - Pro plate 1 x hook and 1 x Velcro 50x10cm if necessary easily the Velcro straps on each form and Cut to size. Installation Manual in English enclosed with every single piece. Cover closes with 3 security pins press up to lock the cover. Installation Manual in English enclosed with every single piece. Fast andEasy fitting. No drilling or cutting required. - Super strong self-adhesive KLETTOX Holds in all weather, speed even washes !! 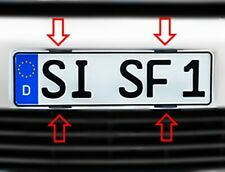 - Suitable for all EU license plates with the dimensions of 360- 520mm x 110/120 - Quick and easy installation without spec. Tool - Super optics Frameless - The principle: Pro Shield 1 x hook and 1 x Velcro Self-adhesive without tools or screws - Heat and cold resistant from -30C ° to 100C ° - Per shield 1 x hook and 1 x Velcro 50x10cm If required The Velcro straps are easily tailored to any shape and size. Installation Manual in English enclosed with every single piece. Adjustable fastening for plates in various height (108mm - 117mm). -Suitable for all EU flag with the dimensions of 360-520mm x 110 / 120 quick and easy installation without spec. Tool - Super optics frameless - the principle: per plate 1 x hook and 1 x Velcro adhesive without tool or screw - heat - and cold-resistant from - 30 ° c to 140 ° c - strong hold (wash! for Klettox no problem!) -Hooks per plate 1 x and 1 x Velcro. Size of holder: length 52.5cm and height 13cm. · Easy number plate removal (no tools needed). · Built in springs reduce plate vibrations and noise. 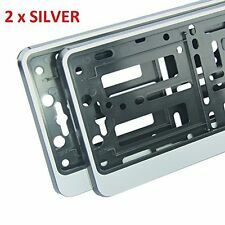 2 x HIGH QUALITY SILVER EFFECT NUMBER PLATE SURROUND HOLDER. 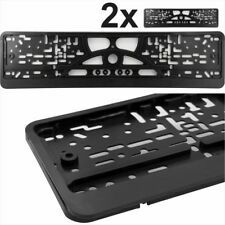 Made from hight quality ABS PC plastic with a. Silver Effect. look of your car. For AUDI VOLKSWAGEN. Size of holder: length 52.5cm and height 13cm. · Easy number plate removal (no tools needed). · Built in springs reduce plate vibrations and noise. Fit all standard number plates, which have maximal Size of holder DON'T DRILL YOUR REG. Adjustable fastening for plates in various height (108mm - 117mm). Fast andEasy fitting. No drilling or cutting required. · Discolouration resistant (due to exposure to the sun and high temperatures). for AUDI VOLKSWAGEN. Size of holder: length 52.5cm and height 13cm. · Built in springs reduce plate vibrations and noise. 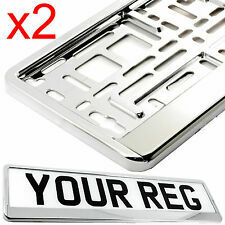 1x (one) SILVER PLASTIC Thesquare number plate holder 11" X 8" (280mm X 200mm) (pressed aliuminium number plates). 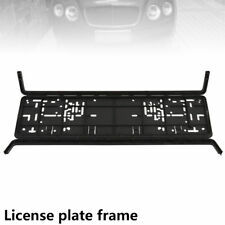 Thesquare number plate holder is standard size Universal for any Car. Back saver for seats. Hinweis II Endfestigkeit wird nach 48Std erreicht. after receipt of. -Heat - and cold-resistant from - 30 ° c up to 140 ° c. If you are satisfied with our service, we ask you set the maximum number of stars. Adjustable fastening for plates in various height (108mm - 117mm). · Discolouration resistant (due to exposure to the sun and high temperatures). Size of holder: length 52.5cm and height 13cm. · Easy number plate removal (no tools needed). Adjustable fastening for plates in various height (108mm - 117mm). Installation Manual in English enclosed with every single piece. Water Resistant Overprint. Installation Manual in English enclosed with every single piece. · Discolouration resistant (due to exposure to the sun and high temperatures). for any MAZDA Car. Size of holder: length 52.5cm and height 13cm. For any AUDI Car Tuning. Size of holder: length 52.5cm and height 13cm. · Easy number plate removal (no tools needed). For any Volkswagen Car. Size of holder: length 52.5cm and height 13cm. · Easy number plate removal (no tools needed). · Discolouration resistant (due to exposure to the sun and high temperatures). 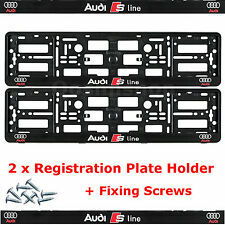 for any AUDI Car. Size of holder: length 52.5cm and height 13cm. · Discolouration resistant (due to exposure to the sun and high temperatures). for VW Car Tuning. Size of holder: length 52.5cm and height 13cm. Easily installed - simply remove your number plates, place the surround behind the plates then secure into place. EU countries. Suitable for all standard UK and EU sized plates, for front or rear of most cars. A quick very effective way of improving the look of your car. Will easily fit all standard UK end EU number plates 52 cm x 11 cm. 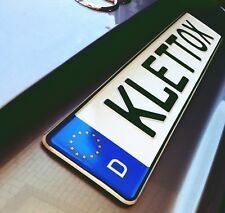 Will easily fit all standard UK and EU number Plates. The holder is standard size. PORSCHE 986 BOXSTER (2003 - 2004). - IN THE LAST PICTURE PART MARKED AS No. 21.